This is the tagline to the name Huvafen Fushi. Which I find very, very apt. And just a little teeny bit ironic. It’s true that every moment we had in Huvafen Fushi was the type that dreams are made of. But they were the kind of dreams we didn’t want to wake up from. As soon as we stepped foot at Male Airport, a staff from Huvafen Fushi picked us up. Shaggy led us to the food court where it was air conditioned as he advised us that we are still waiting on 3 more couples coming from different international flights. This was fine by us as it was nice and cool at the food court enclosure. It should be known too, that for an additional fee, there is an option for a private transfer, where you will be immediately transferred to the resort without waiting for other guests. 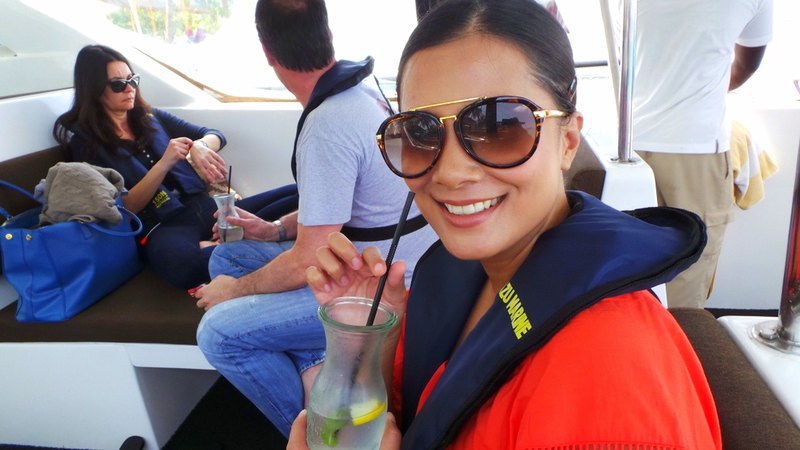 After about 30 minutes, we hopped in Huvafen Fushi’s speedboat. The welcome drink was my favourite among all welcome drinks (because we are not counting the welcome ice cream). It’s a lime, mint and ginger infused cool drink that was so, so refreshing! The speedboat ride to the resort took about 40 minutes. And after we were given the safety briefing, we were also given a summary of weather at the resort for the next 3 days, and the most important part — we were advised to move our watches and time to an hour forward. Yes, Huvafen Fushi the resort has it’s own time zone. We were greeted by management and our respective Thakurus (Villa hosts / butler). The Thakuru assigned to us was Imran (or Imre), a very well-spoken and refined Maldivian gentleman with a pom (english) accent that will have Jeeves make a run for his money. Rooms weren’t ready yet when we arrived (this was around 11AM) some guests just explored on their own, while we opted to have our early lunch. We had lunch served from Fogliani’s by the pool. 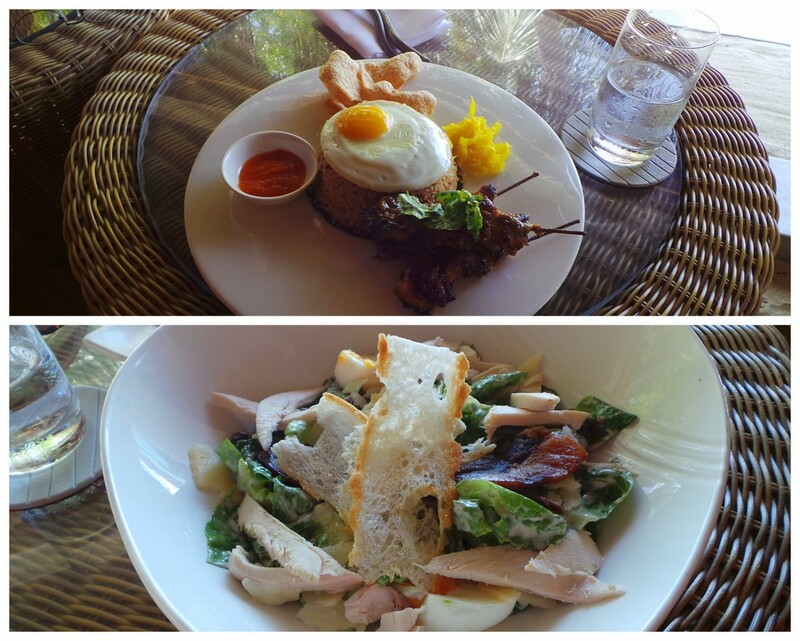 Lunch is an outdoor affair at Fogliani’s under the canopy of trees. There was one afternoon when it rained temporarily so all guests transferred to Celsius, the next door breakfast & dining restaurant. There are only 44 bungalows in Huvafen Fushi. (This is a small and exclusive number in the Maldives) Therefore the spacing in between bungalows are really wide and far apart. Definitely no issue of privacy here. The not so mini-bar is also one of the most comprehensive and biggest I’ve seen. 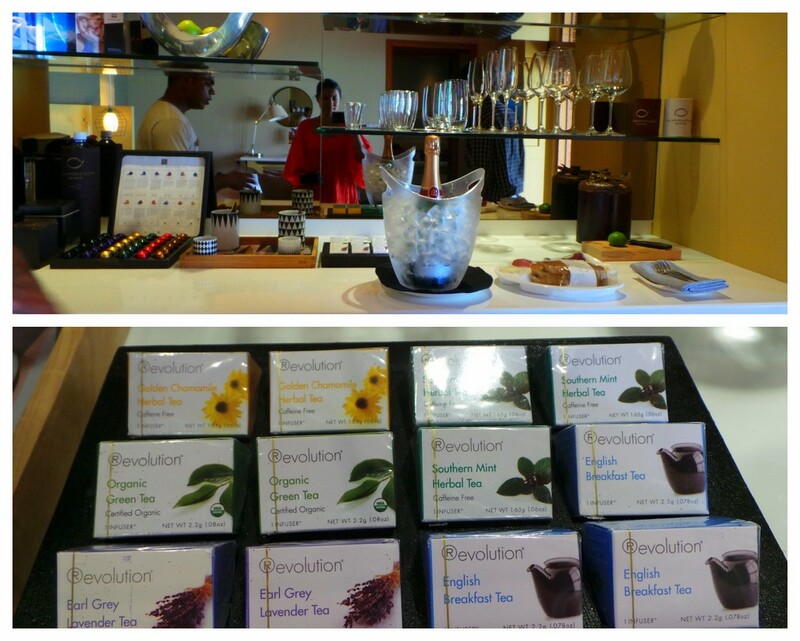 An array of coffee and tea with choices so varied that you may find yourself in a decision-making dilemma. There were also music CDs and adult toys at the minibar for purchase. 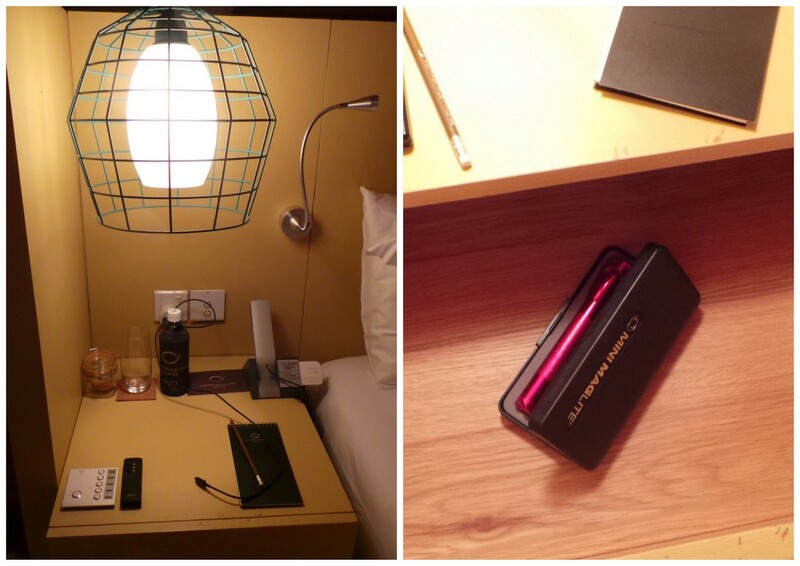 Definitely one of the most original items I’ve seen in a hotel/resort mini-bar! 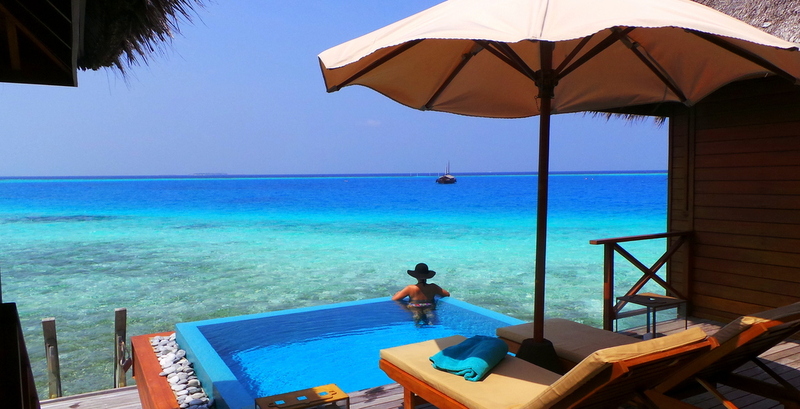 I’ve very little doubt that Huvafen Fushi’s infinity pool is one of Maldives’ best. I’ve seen some infinity pools just placed next to the ocean and that’s it. Huvafen Fushi’s is well thought of, with the mosaic blue tiles and shape that does look like it opens up to the sea. 51 shades of blue if you ask me. It’s so soothing to relax in the pool after a long day of snorkelling in the ocean. We almost always had the pool to ourselves despite the resort being on full capacity. Quite amazing. 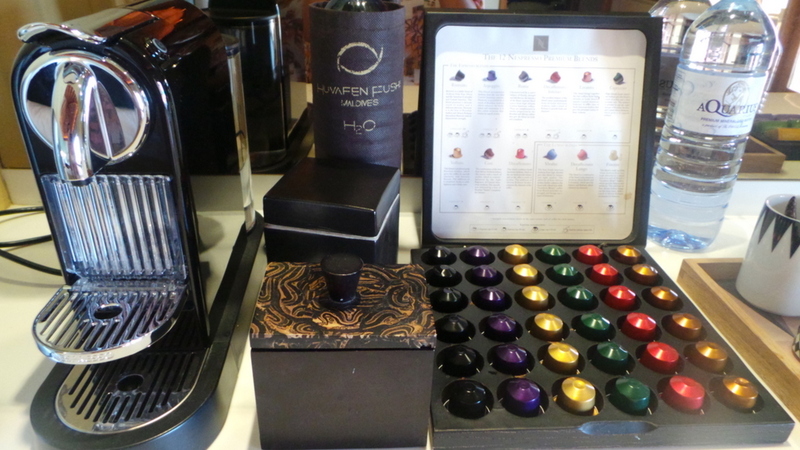 We’re so impressed and very very pleased with the waters of Huvafen Fushi. Their house reef is very much alive with marine life, and you need not venture far (or dive) to see turtles and sharks. Using the very versatile Sony HD AS30V, we were able to take a lot of underwater footage. Here’s a video of the snorkelling in Huvafen Fushi taken by Zombie. Be sure to watch it in HD ! I also tried (and failed) to swim along side a reef shark. It was one of the bigger reef sharks we saw, and was swimming on very shallow waters because the fish (which are her snacks, yes I know it was a she as she was pregnant!) take shelter in the corals. You really have to switch to HD 720 setting to see the shark in this video! 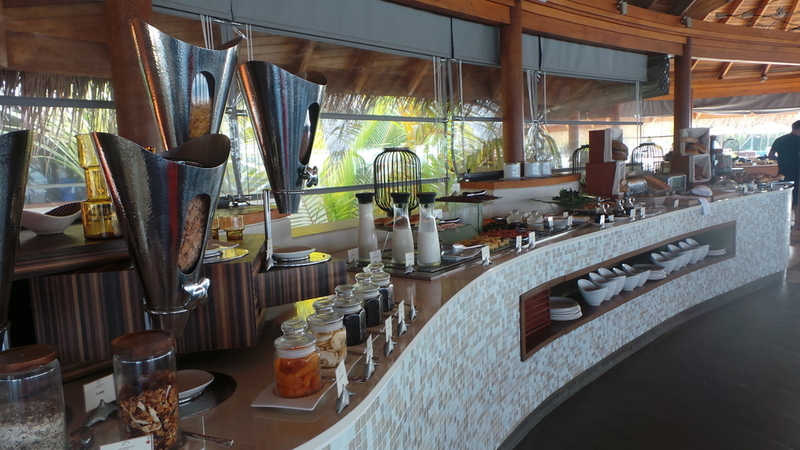 For a person who doesn’t normally have breakfast, it was an affair I looked forward to in Huvafen Fushi. The reason why I’m not such a breakfast person is because I don’t really feel like eating first thing in the morning. What I do love is they also have a juice station for those on a cleansing or detox diet. 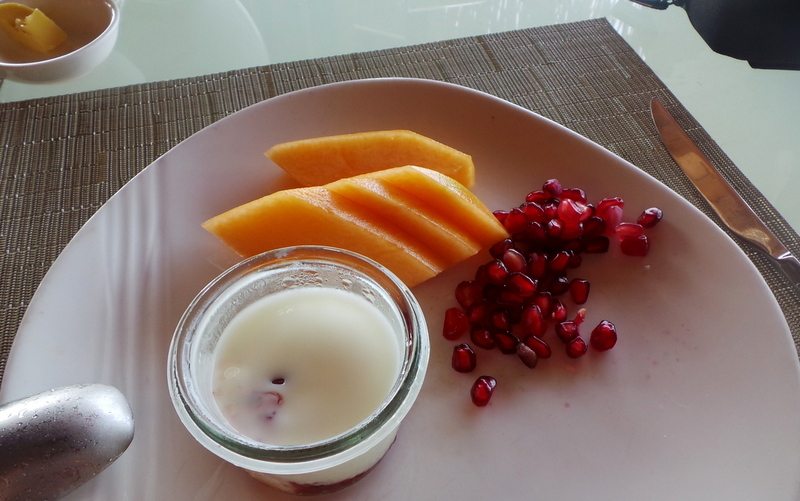 As for me, I made a beeline for the fruits and home made yoghurt. It was one of the creamiest freshest yoghurt I’ve had. Topped with pomegranate seeds and melon, yum! We also had a superb Japanese degustation course for dinner one night. This dinner deserved an entire article of its own so I Wrote about it here — please click so you can read and see in detail the 9-course Japanese degustation meal we had in Huvafen Fushi. This degustation course is done once a week on Thursday nights. 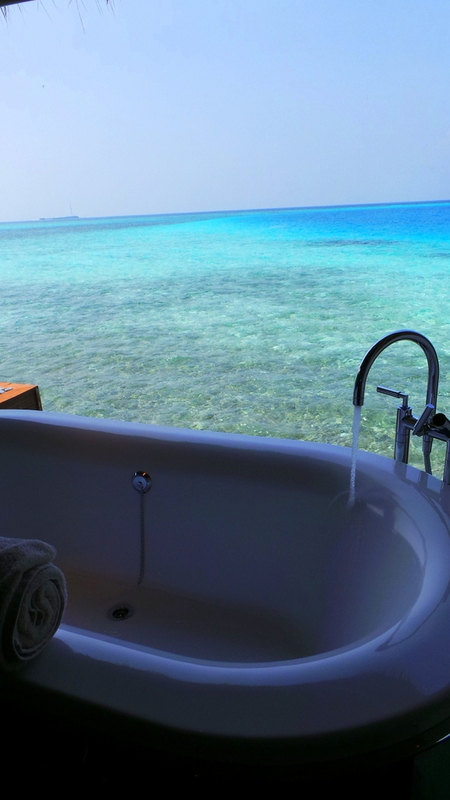 Huvafen Fushi has opened the Maldives’ first underwater spa. The experience is quite surreal and could very possibly be one of the most indulgent things I’ve done in a while. 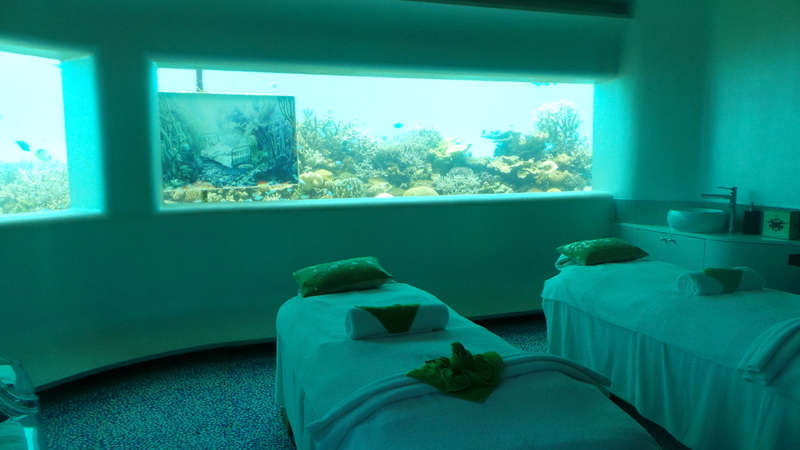 CLICK HERE to view my write up about getting a FLUIDITY treatment from Huvafen Fushi’s Underwater Spa. I love all kinds of rays, and I think I may even be a little obsessed about them. My love affair with them started in Bora-Bora when I was happily swimming in the water, and I stopped and stood for a bit to adjust my mask. And then without warning, I felt this sensation of being enveloped in a silky embrace from behind. A giant sting ray had come up and climbed on my back and I swear, used my back to scratch its underbelly. It was a sting-ray shimmy and since then I have fallen in love with them. 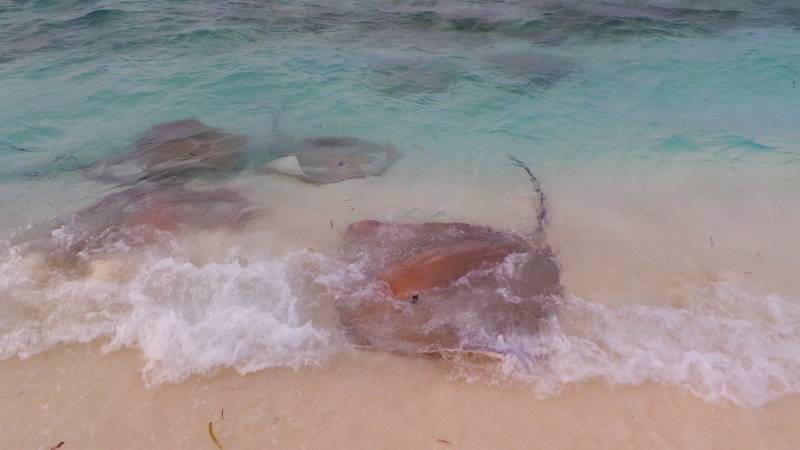 Imagine my sheer joy to know that every 6PM, Huvafen Fushi holds a sting ray feed by the beach. To me, sting , eagle and manta rays will always be the angels of the ocean! 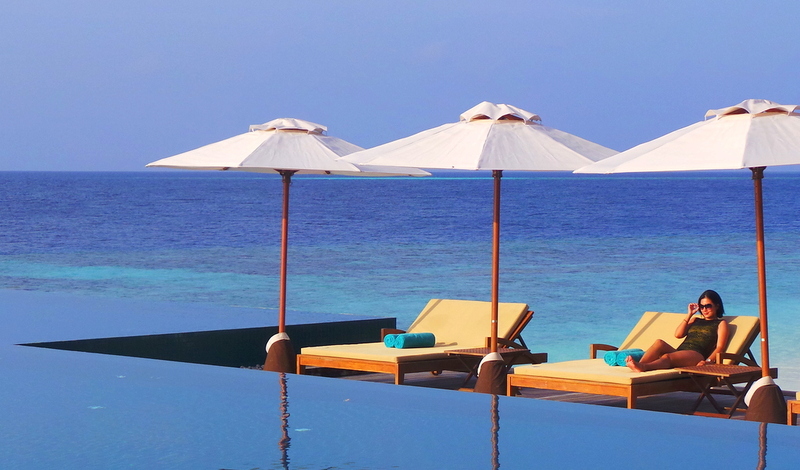 Zombie and I are unanimous in saying Huvafen Fushi has topped our list of Maldives resorts. It fits all the bill of what we look for in a resort : amazing rooms, beautiful and accessible marine life, exclusive and indulgent without going over the top. I did see a few guests with children however I would recommend Huvafen Fushi to couples, honeymooners and adults. 1.) An airport lounge would make it perfect. 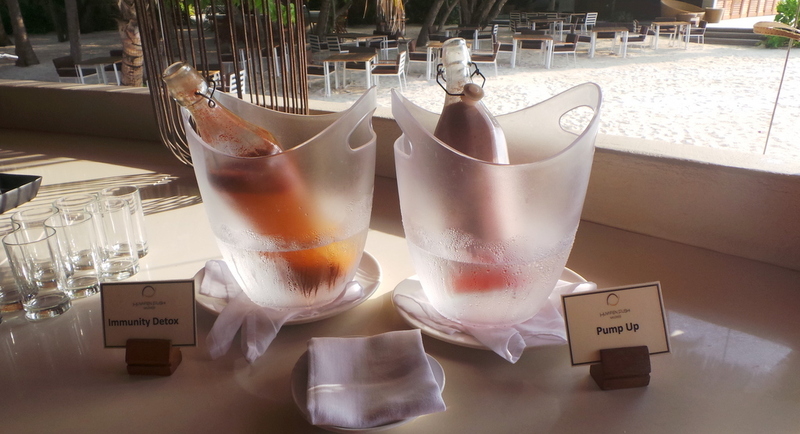 NIYAMA , also a Per Aquum resort, has an excellent airport lounge. Knowing what Huvafen Fushi is like, I can only imagine what a stunning airport lounge it would have in Male. 2.) While lunch is normally almost skipped by guests when they are on holidays, I think it would be a good idea for guests to have an option to take the al-fresco dining or indoors (maybe even just a small part of nearby Celsius restaurant). 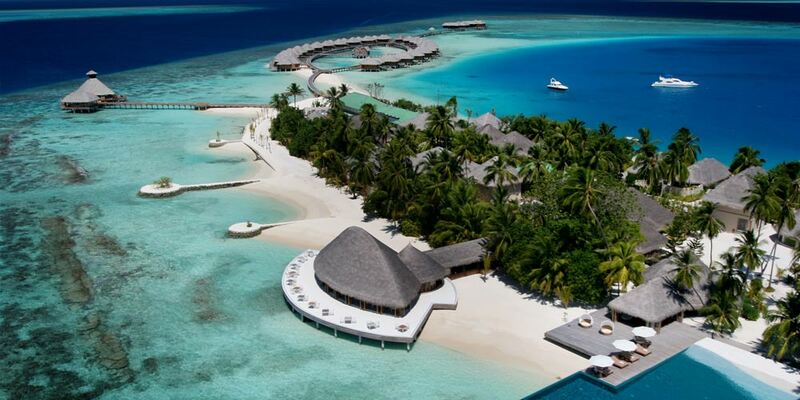 Huvafen Fushi overall is a resort that fits the Holy Smithereens travel style – it is very luxurious but adventure is always close by. While there are excursions available, we were able to get our adventure fill just within the resort. 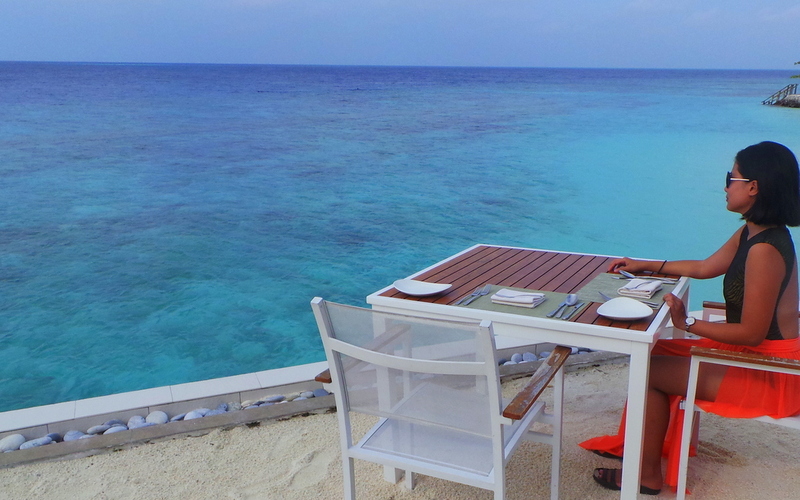 Yes, Huvafen Fushi gets our thumbs up, and we will be glad to return. Now tell me, what is YOUR kind of resort? We were guests of Huvafen Fushi. There is no obligation to write a favourable review, and as always, all thoughts and opinions are my own. Hi Jean, you have a lovely blog! 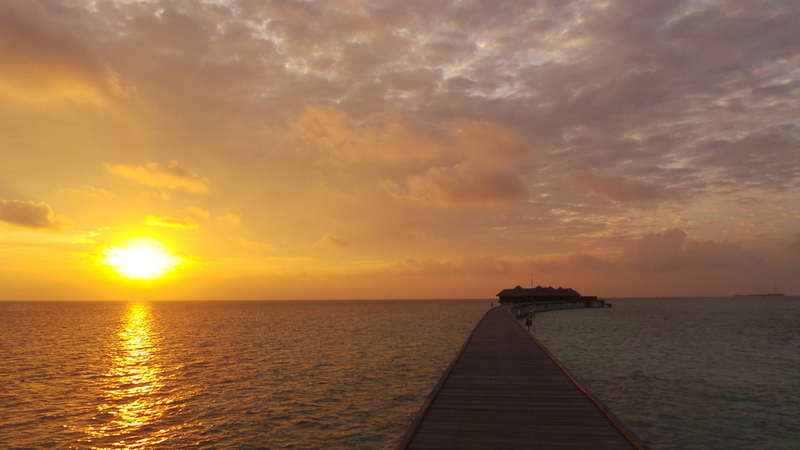 And this post of Maldives just makes me want to visit it even more! But with our big move, we wont be travelling until we are fully settled. Look forward to reading more about your adventures. Wow, your photos are incredible! Love them all! Incredible story and photo coverage, Jean!! one of the best I’ve seen recently! The photo of you “stepping into dream time” got stock in my head… amazingly beautiful capture! could be a perfect advertisement. Wow Alex, coming from you the memographer, that is flattering and an honour 🙂 All my memories in Huvafen Fushi had been like a dream really! – almost unreal! Ahh this looks so amazing! I’ll be bookmarking this one as one of the options for my honeymoon although I have a feeling it might be a little out of my budget. Just curious is Maldives safe currently being Muslim and all the “stuff” going on not to far from there? Excuses the ignorance I simply don’t know. Excuse me as I pick up my jaw from the floor! WOAHHHH mumma! This place looks amazing. Seriously girl – what are you doing to my bank account. I need to add this to my must do before I do list. Ok, decided: have to find me a sugar daddy now ha. Ps that underwater sweet.. dreamy! 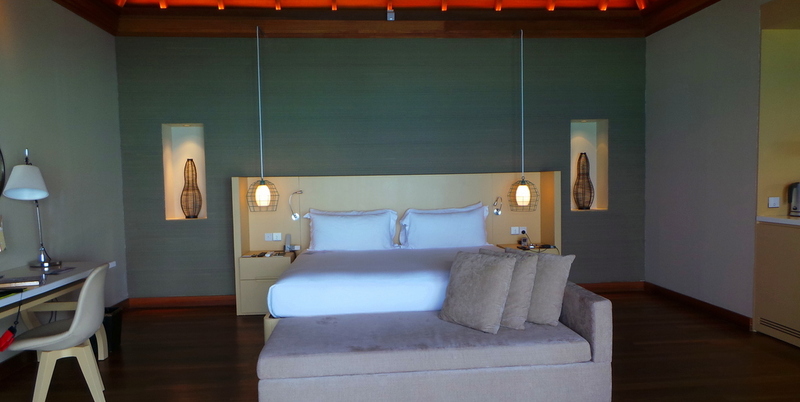 Hi Lucy, my jaw dropped too when I entered the overwater villa. 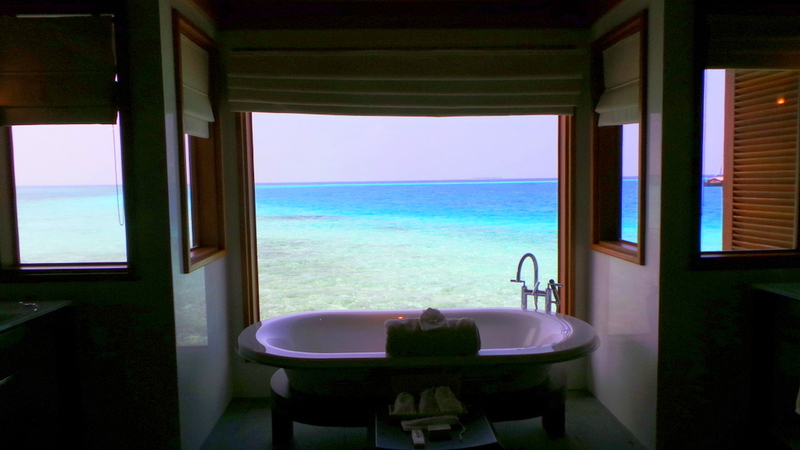 This was my favourite room in all of the Maldives resorts! I am speechless… just wow!!!! How did you find the strength to leave? lol! How?? With great difficulty!!! haha , seriously 🙂 It just made us vow that we’ll be back one day..sooner rather than later! 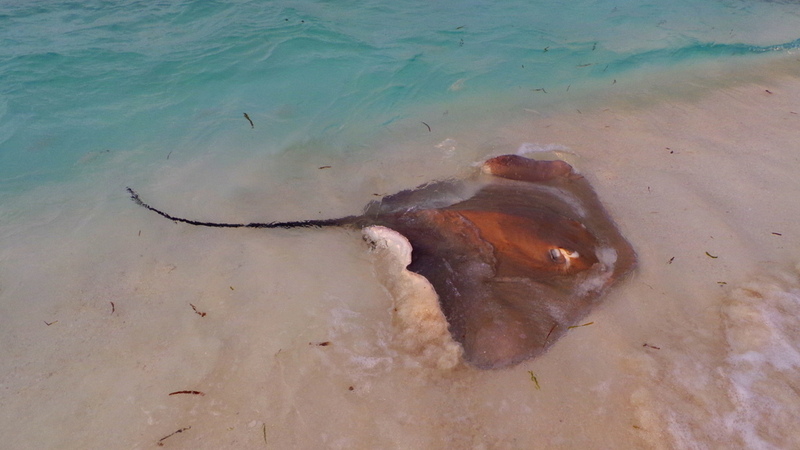 Be careful with those sting rays… They can “sting”. Hi Jean, lovely blog! Would you know how much is the cost of underwater spa treatment?